On the page, there are weekly (or as near to weekly as I can get) updates of the progress of the various lattices (sub-projects) as well as news of updates to the project. If you want a reason to join in, then think of it in terms of utility. For comparison, let's use distributed.net's RC5-72 project. A typical Muon1 lattice by comparison is much larger. Often in the 1x10700 range (that's a 1 with SEVEN HUNDRED zeros after it. 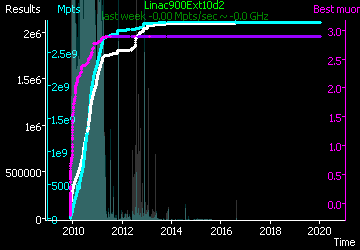 One lattice that has been running for the past year is Linac900Ext10d2. Over the past year, it has had 1.6Million of that 10700 simulations returned, and is doing fairly well, as can be seen from this results graph. In fact, it's getting close to completion (as can be observed from the previous lattices). The only downside is, Muon1 is currently windows only.